INTRAGUARD is a water-based, penetrating sealing compound for exterior concrete and masonry surfaces. 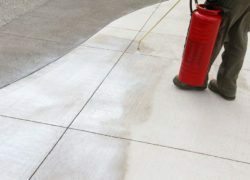 Specifically designed to limit the intrusion of moisture and chlorides into the substrate, this proprietary blend of silane and siloxane penetrates into the pores of the concrete and masonry to help protect the surface from scaling caused by deicing salts as well as protecting vertical masonry surfaces from the ingress of water. INTRAGUARD weatherproofs and protects virtually all concrete and masonry surfaces, including driveways, masonry, walkways, and vertical walls. The product is designed to provide lasting protection from de-icing chemicals and moisture intrusion. The product can be used on both horizontal and vertical surfaces. Suitable application include architectural concrete, concrete block, split face block, pavers, stucco, porous and dense brick, clay tile, and exposed aggregate concrete. When properly applied INTRAGUARD does not form a film– it penetrates the surface to form an integral barrier to moisture penetration. Leaves no gloss or shine. Breathable – does not trap moisture. Reduces chloride penetration into concrete and masonry surfaces. Helps protect properly placed and cured concrete and masonry from scaling and freeze thaw damage caused by deicing chemicals. Can be used as a primer for improved adhesion with paints or mineral substrates. PENTREAT 244-100 is a reactive, penetrating, 100% active silane sealer that inhibits water and chloride ion penetration in concrete and masonry structures. PENTREAT 244-100 is a hydrophobic, impregnating sealer that helps prevent chloride-induced corrosion of rebar, scaling, spalling, freeze-thaw damage, and other causes of debilitating concrete. PENTREAT 244-100 is designed for use on horizontal, vertical, overhead, new and existing concrete and masonry above-grade surfaces. Suitable applications include residential commercial, industrial, and municipal projects. PENTREAT 244-100 can be used on all types of concrete, including parking structures, driveways, plazas, patios, walkways, median barriers, bridge decks and piers, ramps, traffic barring concrete, marine structures, vehicular repair and wash down facilities, and loading docks. High-performance, breathable, reactive, penetrating, superior water repellent sealer. Provides an effective chloride screen. Minimizes penetration from de-icing chemicals, salt, water, etc. that may damage concrete/masonry surface. Reduces spalling of new concrete surfaces. Will extend the life of concrete and masonry structures. Penetrates deeply for maximum protection. Seals pores and capillaries of substrate, preventing liquid absorption while allowing excellent vapor transmission. Leaves no residue/Requires no cleaning after application. PENTREAT 244-40 is a penetrating, 40% active silane sealer that inhibits water and chloride ion penetration in concrete and masonry structures. PENTREAT 244-40 is a hydrophobic, impregnating sealer that helps prevent chloride-induced corrosion of rebar, scaling, spalling, freeze-thaw damage, and other causes of debilitating concrete. PENTREAT 244-40 is designed for use on horizontal and vertical, new and existing concrete and masonry above-grade surfaces. Suitable applications include residential commercial, industrial, and municipal projects. PENTREAT 244-40 can be used on all types of concrete, including parking structures, driveways, plazas, stadiums, patios, walkways, median barriers, bridge decks and piers, ramps, traffic barring concrete, marine structures, vehicular repair and wash down facilities, and loading docks. High-performance, breathable, penetrating, superior water repellent sealer. Reduces spalling of new concrete surfaces . PENTREAT 244-40 OTC is a penetrating, 40% active silane sealer that inhibits water and chloride ion penetration in concrete and masonry structures. PENTREAT 244-40 OTC is a hydrophobic, impregnating sealer that helps prevent chloride-induced corrosion of rebar, scaling, spalling, freeze-thaw damage, and other causes of debilitating concrete. To contact your local W. R. MEADOWS representative or for general correspondence, please click here. If you need immediate assistance, please call (800) 342-5976. Thank you! DECK-O-SHIELD is a ready-to-use, water-based sealer/water repellant for natural stone, concrete, and masonry surfaces.